We are Talking About Saving Money Today! Quilting is just like any other consumer related activity in that we are bombarded with beautiful images that make us want to buy more. These images come not only from the manufacturers of the goods and the shops selling them but also from other quilters. 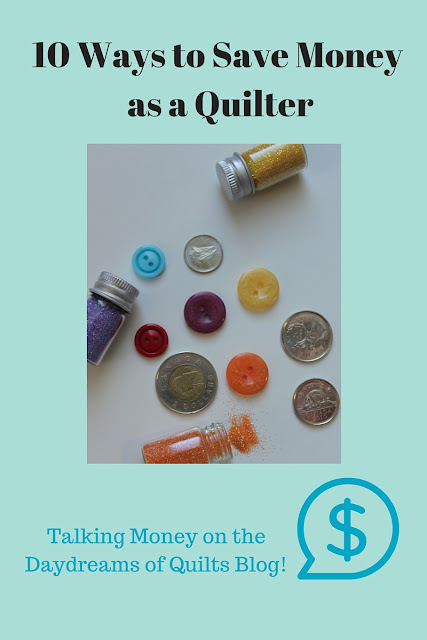 Sometimes quilters are posting to show what they bought (think "Sunday Stash") and sometimes they are posting on behalf of manufacturers and shops as a sponsored post or as an affiliate marketer. It is easy to get caught up in this, click over to buy and then feel self righteous about purchases made (and possible over spending) because it's for our craft. It's for something we are passionate about and it will be made into something beautiful for ourselves or someone we gift it to in the end. Now I love shopping just as much as the next person and if I had unlimited resources I would probably happily buy without giving it much thought. Or would I? I think all of us are thinking about the greater impact of our purchases. And if we aren't - we should be. We should ask ourselves; how is this impacting the environment? My family? My own happiness? Rampant consumerism is not healthy for our planet, our society or our relationships. I am not the first quilt blogger to think about this. Diane at From Blank Pages wrote a heartfelt post in which she laid it all on the table about her fabric addiction and the impact it had on her and her family. Most of us do not have unlimited resources and we need to buy responsibly and find ways to stretch our dollars. Not to mention that quilting is also a very expensive hobby. With these points in mind I have put together a list of ways quilters can save money. This point is obvious of course. Many of us buy fabric with no particular plan for it. Try to set up your stash as if it were in a shop, such as like colours together and/or fabrics from the same line together. This way it's easy to find things, it's fun to look at and you can see what you have. I have bought some inexpensive white book shelves (about $50 CDN each) where the openings are like square cubbies from Walmart (even less expensive than IKEA). I sort my fabrics by colour in the cubbies of one (there are six cubbies) and I sort by fabric designer in the other. When you do shop from a quilt shop have a pattern in mind that you are buying for rather than always picking up random fabrics that strike your fancy. There was one blogger I used to follow (she has since stopped blogging) who would only buy what was needed for a project. When the project was finished she would give away or sell her scraps. She never kept a stash. I am not that disciplined but if you are it's an idea to consider. I was going to suggest unsubscribing from online shop newsletters in this list so that you are not even tempted to shop. I decided instead to say to watch for sales. If you unsubscribe from the newsletters you may not know when the shops have sales. In the past I have unsubscribed from all shop newsletters though and if you are really trying to cut back that is a way to prevent some of the marketing bombardment. Keep your sewing machine clean, follow manufacturer's directions for your iron, get sewing scissors sharpened and generally keep your supplies well cared for. They will last longer and this will increase safety in the sewing room as well. I was noticing my rotary blades seemed to be going dull quickly. I replaced my cutting mat and they are lasting a lot longer plus cutting is easier. Chain piecing is where you feed one piece after another through your sewing machine without cutting the threads. This saves both time and thread. Before I adopted this sewing habit I would take each piece off the machine and trim the thread tails. Each new piece would have two inch thread tails on it too. I would always be throwing palm sized piles of thread scraps in the garbage. I get it. When you are finished your quilt top you just want to be done with the piecing. The last two quilts I've made though I have pieced my backings with leftover fabrics from the fronts and/or other large pieces of fabric from my stash. This saved me about $80 per quilt. You will have beautiful quilts that you want a backing of all the same fabric for but even if you piece only some of your backings from fabric you have on hand you can save quite a lot of money. If there are supplies that you constantly use it makes sense to buy those in bulk. I buy Kona White and Kona Snow by the bolt because I am always using those for backgrounds. This saves me 20% on the fabric plus I get free shipping as the bolts are over the online shop's free shipping threshold. The same goes for batting. I bought a roll of batting last November for under $400 (CDN) and I saved 40% on the cost of batting if I were buying separate pieces for each quilt. I'm sorry to all the long-armers out there but this is a way to save a tremendous amount of money. Spend time learning to free motion quilt and you will save thousands of dollars over the years. I have never sent a quilt out to be quilted, as tempting as it has been, because I simply cannot afford it. Custom quilting can double the cost of a quilt or more. When all the posts about what other quilters have bought is getting you down or making you feel like you have to have that too. Look away. Get off social media and go out for a walk. Wanting what others have will only make you feel bad. I never click in to "Sunday Stash" posts and I try to spend Sundays with family and stay off the computer as much as I can. Instead of being online, be in your sewing room making something fabulous that makes you happy. I have not had room in the budget for new quilting books lately so I have been ordering them into our local public library. The library does not have quilting books that I am interested in but I can have the ones I want brought in through the inter-library loan system. Besides being able to have the book that I want in my hands for at least three weeks this is also a great way to preview books and eliminate some from your wish list. I have actually crossed quite a few off my "want to buy" list after signing them out from the library and realizing they weren't that great after all. I hope this post has been a help to you and I hope you will join in cutting back on over spending and consumerism. Yes, we should treat ourselves now and then but when it starts taking over your life it's time to take a step back and implement some of these strategies.